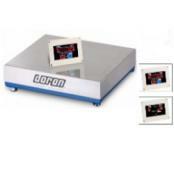 Airline Baggage Scales by Doran offer Outstanding Durability & Reliability. A side load and vertical load protection systems using rubber shock mounts prevents load cell sensor damage from impact and massive overloading as baggage is loaded onto the DBS scale platform. The baggage weight is easily read from up to 20 feet on the large, bright red LED display. 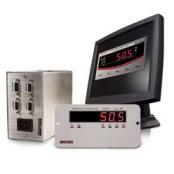 When baggage is placed on the scale, the displayed weight quickly stabilizes on the main and optional remote display. The modular design of the Doran Baggage Scale makes installation a snap! All of the scale's electronics are contained in the panel mount main display - no additional electronics control box to install inside the counter. 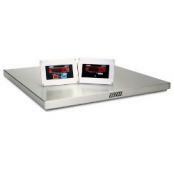 Simply install the main and remote displays into the counter cutouts and connect the foolproof, keyed and locking connectors to the base and the scale is ready to use. Airports throughout the world are finding the rugged simplicity and long life of Pennsylvania Scale M64 (USA) and the C64 (Canada) baggage scales are ideal in the hard knock life of weighing airline baggage. Pennsylvania, a division of Emery Winslow, says Architects, designers, airports and gate supervisors appreciate the clean designs, the rugged construction and sustained accuracy as well as compliance with local Weights and Measures regulations. Due to the increased emphasis on baggage weighing for weight and balance purposes plus charging for excess baggage weight, there is a renewed emphasis by the FAA and local Weights and Measures agencies for high quality approved scales. Rice Lake Tracer Aviation SystemsBusy airports and terminals can benefit from Rice Lake Weighing Systems attractive and user friendly line of Tracer Aviation systems and NTEP certified bench scale platforms. These high-performance devices excel to meet the specific needs of this demanding industry. Doran Low Profile Baggage ScaleThe scale base is less than two inches tall. Doran was the first to introduce this revolutionary design using ultra slim components without compromising durability. The standard base size is 29.5" x 32". For NO ADDITIONAL charge, we can manufacture custom sizes from 18" x 18" to 48" x 36"
Doran Standard Airline Baggage ScaleDoran Standard baggage scale is Easy to Operate and the Baggage weight is easily read from up to 20 feet on the large, bright red LED display. 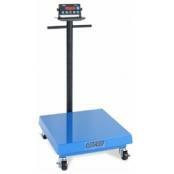 When baggage is placed on the scale, the displayed weight quickly stabilizes on the main and optional remote display. Pennsylvania M64+ Airline Baggage ScaleAirports throughout the world are finding the rugged simplicity and long life of the American Made Pennsylvania Scale M64+ airline baggage scales ideal in the hard knock life of weighing suitcases and cargo that goes on an airplane. NTEP approved. Sizes: 18x24, 24x24 Capacity: 250, 500, or 1000 lb. Don't purchase a set of digital scales until you contact Central Carolina Scale. General manager or facilities manager at the airport - how do you purchase baggage scales? If there is a bidder or approved vendor list that you utilize please add our name into the mix. Our suppliers are the most reliable and dependable in the weighing industry. For example, Doran has served the airline industry for many years with outstanding baggage scale systems including the Standard 24” x 24” recessed in bagwell design and the Ultra-Low (1.63”) Profile top of bagwell design which is available in 18” x 18” through 48” x 36” sizes. Also, if you're an airport located within our service area, you can probably save money and have super accurate scales by allowing CCS to check and calibrate your scales on a regular basis. Contact the service department for details. And if you manage an airport hotel or privately owned airport parking facilities then you can improve your customers experience by providing a high quality and accurate "curbside" style baggage scale as a convenience to your customers. We can assist you with the exact item you need. 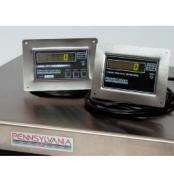 Pennsylvania M64 scales are becoming more widely used by municipalities, Airport Authorities, and commercial Airlines for the purpose of baggage check-in. Major division that use these systems include (but are not limited to) USAirways Pittsburgh; Miami International Airport (all terminals); Alaska Airlines; and many other installations at major airports worldwide like Cancun, Dominican Republic, Lima, Peru, Bogota, and many other abusive demanding applications.